Asian giant moves to realize ambitions articulated by Xi at 19th Communist Party National Congress. China says one thing to the world, but does what it wants, anyway, say experts. 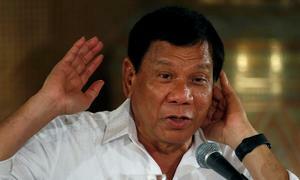 This message is being clearly conveyed by its continued military buildup in the disputed South China Sea area even as it participates in negotiations and actions to defuse tensions, including the adoption of a Code of Conduct (COC). "Actually, China has been active in the South China Sea all this while. What’s distinctive this time is the heightened tempo of Chinese military activities that go along with the ongoing, increasing buildup in the disputed waters - by that I’m referring to more intense naval and air activities, which came after the last Party Congress. “It’s clear that Xi wanted to follow up that last event to showcase his control over the Chinese People’s Liberation Army (PLA), including his promise and call for the PLA to heighten combat readiness in the South China Sea," Dr Collin Koh Swee Lean of the S. Rajaratnam School of International Studies (RSIS), Singapore, told VnExpress. He noted that the Chinese buildup in the South China Sea continued despite after adopting a draft framework on the proposed COC last August, and even after formal negotiations commenced with ASEAN earlier this year. In the 19th Party Congress on October 18, 2017, General Secretary and State President Xi Jin Ping declared that China will complete modernization of its armed forces by 2035, and achieve a world-class military by 2050 that can fight and win wars across all theaters. He also affirmed China's goal to develop a modern maritime military force structure commensurate with its national security and development interests. The PLA's component land, air and naval forces must be able to operate jointly and prevail in both conventional and new theaters of operation, he said. Citing an unnamed U.S. intelligence source, news channel CNBC said that China had in April installed anti-ship cruise missiles and surface-to-air missile systems on three of its outposts in the South China Sea. 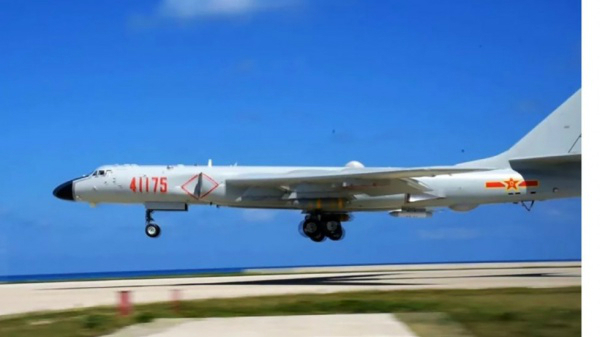 PLA has recently announced that it had, for the first time, landed an H-6K strategic bomber on Woody Island in the Paracel Islands. This bomber, China's most advanced, has conducted take-off and landing training, the channel said. Telling VnExpress over the phone, Dr Alan Chong of the RSIS highlighted the contradiction between China’s words and actions in the South China Sea. At an event in Jakarta, Indonesia, in April, China's representative committed not to use force to resolve the disputes in the South China Sea, but it has been aggressive in its military buildup. "China is playing two games," Chong said. Derek Grossman, a senior defense analyst with American policy think tank RAND, a U.S. government funded nonprofit, told VnExpress that actual deployment of military assets, whether landing of military aircraft or positioning anti-ship cruise missiles, has occurred in an incremental, albeit concerted manner. "What I do think we’re seeing at this time is a conscious effort by Beijing to put pressure on counter-claimants, namely Vietnam, to discourage them from having any hope these disputed territories could one day move to their de facto control. The Chinese bomber landing on Woody Island is a clear example of that in the Paracels," Grossman said. He said that although they are covered less extensively, China’s coast guard and naval patrols, announced last week, represent a preemptive move to tell counter-claimants “don’t even think about it.” The massive South China Sea exercise held in April is another. These events are happening just as seasonal frictions over fishing and natural resource extraction are set to occur, Grossman noted. He said that although the probability of conflict in the region remains low, there is always a chance that competing claims will result in a security incident that escalates into a broader conflict. 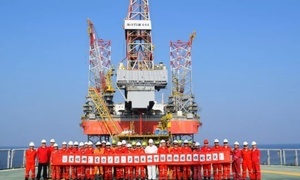 Beijing’s decision to move an oil rig into a part of the sea where Vietnam holds sovereign rights in May 2014 is a perfect example of how such a conflict might unfold, even though China backed down after a months-long standoff. Grossman cited an official Chinese website as saying Beijing was planning to move the same oil rig back into the South China Sea shortly. Dr Chong linked China's actions in the South China Sea with the potential summit meeting of U.S. President Trump and North Korea leader Kim Jong-un. They would be China's signals to warn the U.S. "not to ignore China." Despite the rising tensions in the region, Chong believed that no one wants war. Responding to a question about the U.S. Navy deploying warships and conducting a freedom of navigation operation (FONOP) in the South China Sea near Paracel Islands on May 27, Dr Collin said he wouldn't say the U.S. reaction was weak, but rather that it could be more robust. He said the best reaction would be a coherent, consistent and strong strategy that not only makes use of the military tools for deterrence or “compellence” against Chinese behavior in the South China Sea, but also deploys a more holistic set of instruments. Quad refers to an informal strategic dialogue between Australia, India Japan and the United States. Dr Chong said he believes FONOPs by the Quad can help send signals to China that "This is an open ocean, we have rights to go through under international law." Dr Collin encouraged Vietnam to continue to its fundamental foreign policy approach that emphasizes non-alignment. This would allow more space for geopolitical maneuvering while facilitating Vietnam’s Doi Moi policy of opening up and furthering international economic integration, he said. “The aim is not only to help Vietnam preserve and enhance its national resilience but also allow space to engage other regional and extra-regional partners. This also means not abandoning ASEAN as an important facet of its foreign policy and where it concerns the South China Sea, despite the inherent limitations of the bloc. Where necessary and expedient, Vietnam should continue to stay vocal about maintaining and securing peace and stability in the SCS,” Dr Collin said. Meanwhile, Grossman welcomed the fact that Vietnam has significantly raised the level of defense cooperation with countries like Australia, India, Japan, and the U.S. 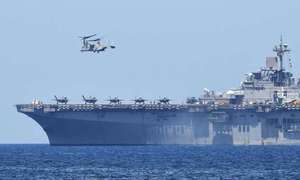 In March, for the first time, a U.S. aircraft carrier made a port visit to Vietnam, emphasizing growing defense ties with Washington. In late May, India sent naval ships to the South China Sea to conduct joint military exercises, the first time Grossman has been able to confirm the two sides have done so. He also saw Vietnamese President Quang’s visit to Japan as an indication that Hanoi wants Tokyo to take on a more active role in the South China Sea. "These activities will help to check China’s growing influence in the region and should therefore continue," he said.